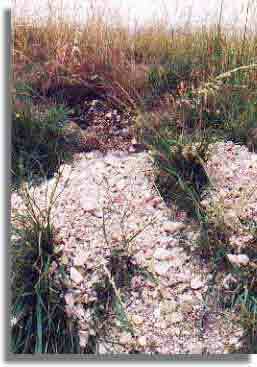 I had been to Wansdyke four times earlier; in 1989, 1992 I saw only glimpses, but in 1994, and only three days before I had the opportunity to see Wansdyke in all its glory. Still bothered by the downsides of pregnancy, Philippine and I went from Frome by car to Devizes for a day-trip to the Museum, then on to visit Avebury and Wansdyke. We had made this trip before, as I can recommend to anyone not staying in the direct vicinity. Devizes, though maybe not a first-rate touristic town, has lots of interesting features, the Kennet & Avon Canal being among the best of them. On Caen Hill, the canal conquers the 237ft of height-difference with no less than 29 locks, where the water is raised from the Avon valley to the Vale of Pewsey. Devizes fields, full of poppies. Wansdyke and Avebury are so close together that you can visit both at leisure in a day-trip if you are by car or bike and when you just want to sniff at them. Avebury has a good little museum and a stroll around the stones will cost you a small hour at most. 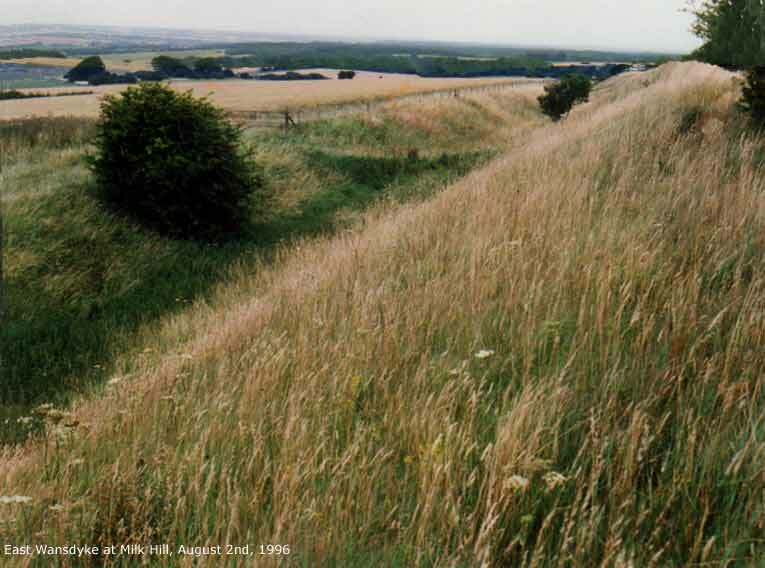 Even when you drive by Sillbury hill and the Sanctuary, you'll have plenty of time for a short walk across Wansdyke. Of course, when you ARE staying close by, I'd recommend a day each at least for both monuments! Avebury and it's Circles, Avenues and environs (such as West Kennett Long Barrow) is close by the Ridgeway and you can walk for miles around to get to understand the landscape. The same goes for Wansdyke, the more since east Wansdyke has a permissive path for most of the course of the Dyke from Savernake Forest to Morgan's Hill. The Wansdyke Cabinet in the Devizes Museum. To the left, the researchers of Wansdyke. To the right, the course of Wansdyke. This Friday, we started at the museum in Devizes. As a member of the WANHS, this was a rare opportunity, as I'm not usually around to enjoy their activities. 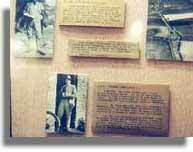 The museum has a large collection of material concerning the human and natural history of Wiltshire. My favorites are the archaeological and early historical expositions; the Museum boasts one of the finest prehistoric collections in Europe (rivalling that of the British Museum!). No surprise, since the WANHS is concerned with the upkeep of such monuments as Stonehenge, Avebury, Sillbury Hill and West Kennett Long Barrow. Compared to this, Wansdyke is treated rather meagerly, with just two display cases of an origin that dates back a few years. This is a pity, even more so because no other museum seems to be concerned with this earthwork of no small proportions. 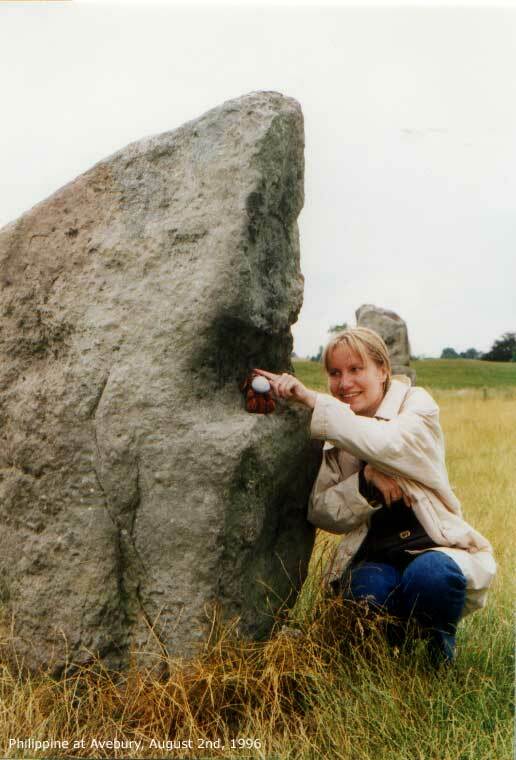 After the museum, we headed north for our third visit to Avebury. Although it proved to be a shorter one than the two that went before (the large crowds diminished the ambiance severely), it was satisfying enough. 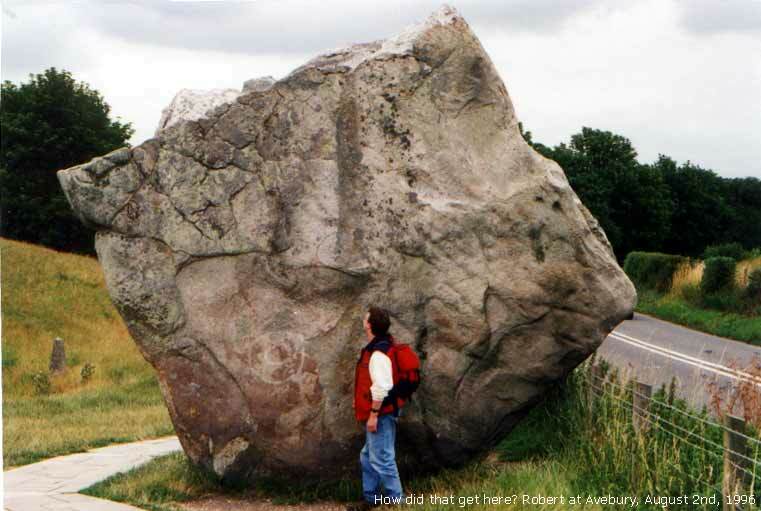 The stones are always imposing a kind of humility on you, it's difficult to describe. I suggest that you'd best visit this place out of season for the best mystical fealing. 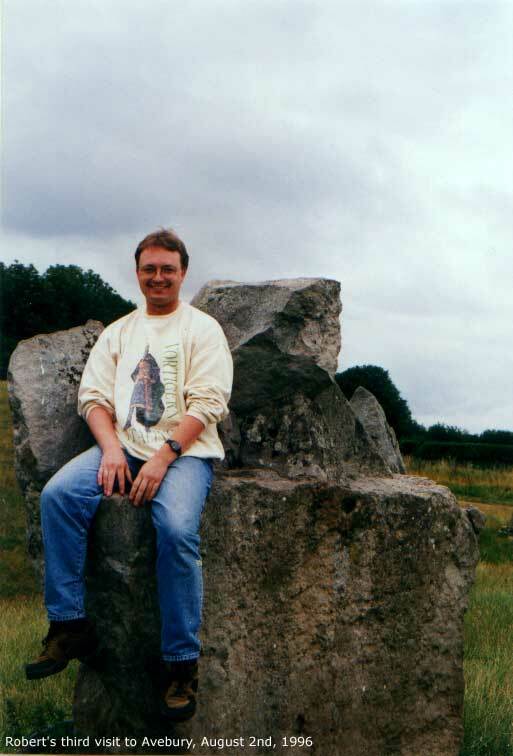 Our visit to Avebury, 1996. Above: the Swindon-stone (nr. 46). Left, our little mascotte posing.. Right, my third time on stone 41! However, having said that, one should not make the mistake of imagining Avebury to be experienced 'best' without anyone around. Remember, this place was created by a multitude of people, working with thousands together to dig out the immense ditch. Their festivals were most likely, judging by the size of the place (it has been said to dwarf Stonehenge like a cathedral does a parish church! ), for the same multitudes. Therefore, having crowds around is not necessarlily a bad experience. For the completion of the tour, we headed south across the Downs to the spot where we visited Wansdyke two years ago. To our amazement, the little car park at the top of the ancient Droveway was now blocked off, prohibiting the parking of cars by the visiting ramblers. Pewsey County Council (or whoever responsible) should be ashamed of this blockade, it diminishes the access to a monument that already lacks the attention sorely needed for its protection.. We did not let this act of disinterest stop us and parked the car on the hard shoulder - illegal, but what's a guy to do in such a case? Philippine stayed behind (too tired, remember?) as I went back to the spot where my pictures were spoilt two years ago. Once again I followed the ancient track to the 'shore' (click here to enlarge the image below left) on top of Milk Hill, enjoying the views south and east towards the Vale of Pewsey, but in rather more haste. The weather was still overcast, but that made the steep climb a lot easier. This spread (click here to enlarge), shows Milk Hill south of Wansdyke, looking across the dry valley once known as 'Woden's Valley'. Looking left to right are the Old Burgh, the Ridgeway crossing behind the trees, Knapp Hill and right Adam's Grave. This neolithic long barrow was once called Woden's Barrow, and a battle was fought here in Ad 594 and again in AD 715. In the background lies the Vale of Pewsey, behind which rises Salisbury Plain. I passed the ancient enclosure known as the 'Eald Burgh', which might have been a holding-pen for the horses of the soldiers that once guarded this frontier... In those days, the Dyke was a frontier, guarding the roads from the north. This territory was probably just as hostile to both the defenders and the Saxons who faced the invading Danes centuries later. 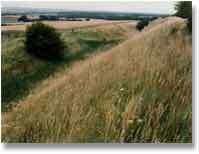 It has been long thought that Wansdyke was built against these Saxons, but I doubt that - it is too early for that. In fact, the Saxons named it after their god Woden, so they probably didn't know when it was created. This makes a case for a civil war scenario - Briton against Briton in the early fifth century. And who? Maybe the father of Ambrosius Aurelianus (mentioned by the sixth-century monk Gildas), who possibly fought Vortigern at the battle of Guoloph in Hampshire, around 437 AD. But when Vortigern was betrayed by his Saxon federates at Amesbury (lit. 'Ambrosius' stronghold') around 441 AD, this can only mean that he was the enemy of Ambrosius..and that Ambrosius lost the battle. Which is confirmed by archaeological research, which has shown that the ditch silted up after just a few years' service. 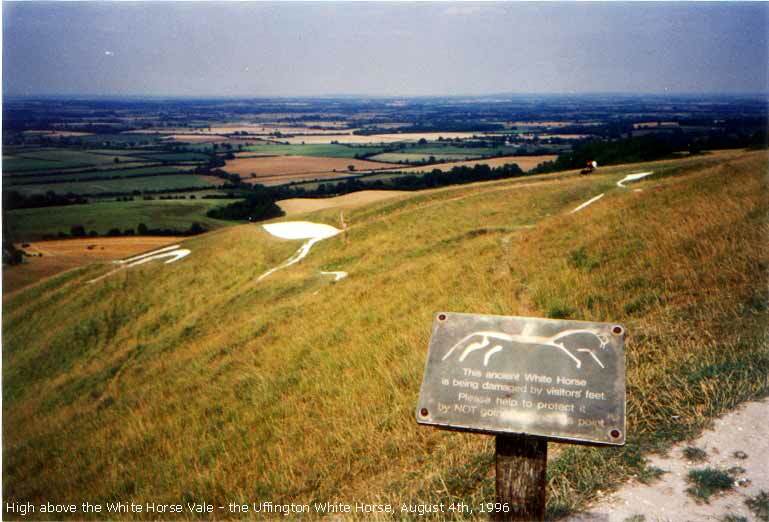 To see the bare chalk, dug from the Dyke by rabbits, makes you wonder what a grand sight this monument must have been when freshly completed, gleaming white in the sunlight across the green Downs.. This spread (click here to enlarge), shows East Wansdyke on Milk Hill, looking east and from left to right to the Kenneth Valley across the West Woods to the Vale of Pewsey. 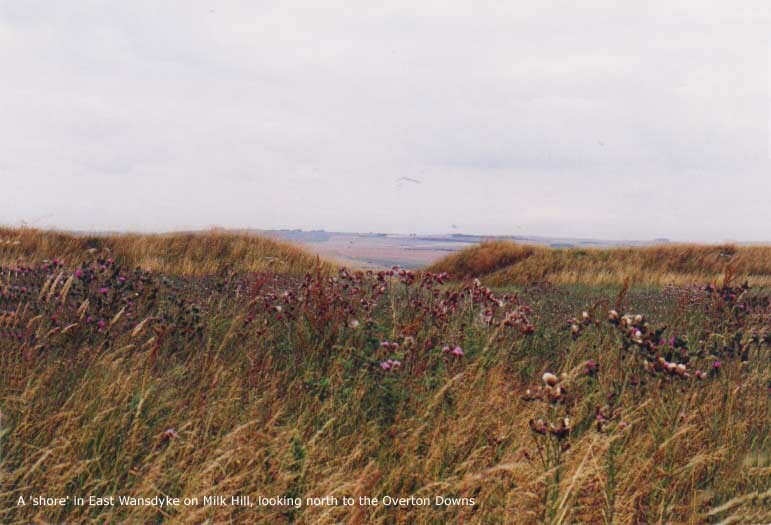 This spread (click here to enlarge), shows East Wansdyke on Milk Hill, with the view north to the Kenneth Valley. Directly north are Sillbury Hill and Avebury Stone Circle. Well, anyway, when I had made my pictures I turned back and we went back to Frome. This was the last time I went to see Wansdyke. Our last week was based in Oxford. We visited the hill-forts of Barbury and Liddington Castle later that week, closing off with a return to Uffington Castle and the ancient White Horse (click here to enlarge).